The Minimalist telescopic riser shower kit from Ultra is part of our contemporary collection of bathroom products. A rigid riser kit provides your bathroom shower with a solid base, a fixed pole and shower head in one. A rigid riser positions the shower head above you. 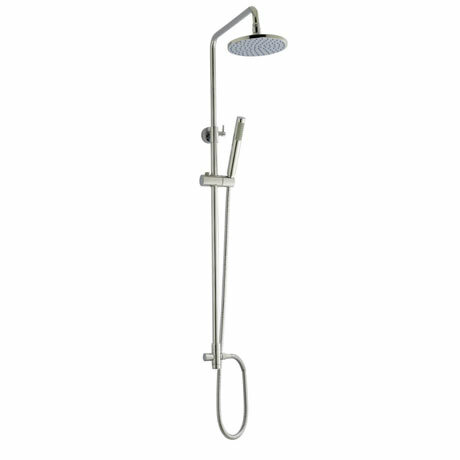 Modern styling with chrome finish, give your bathroom a makeover with this superior quality rigid riser kit with round shower head. Q. Is the riser kit adjustable in height from the outlet to the top of the rail? If so what is the min. And max. Height?. Also what type of outlet do i need to connect on to the riser rail? Unfortunately this is not adjustable. It would need to be connected to an exposed shower valve. Our old exposed riser shower was poorly made and sprung a few leaks. As our valve is on another wall, it was hard to find a riser kit that didn't also include valves. What's nice about this one is that it only has one attachment point, so minimal new tile-holes to be drilled. Also, the telescopic riser means that you can adjust the height and head positioning AFTER installing the kit.